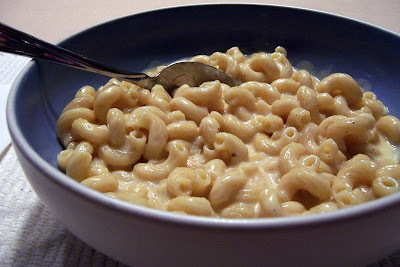 Another mac 'n cheese recipe?!? Sure, I'm thinking we have at least a few more in store for you. This is one of our go-to weeknight meals. It's really easy, and it's tastygood. The original recipe is from Alton Brown's Good Eats (of course), but we've been tweaking it since we first made it. *yup, I guess you could use white pepper so you don't see it in the final dish. I like to see the pepper in the final dish. 1. 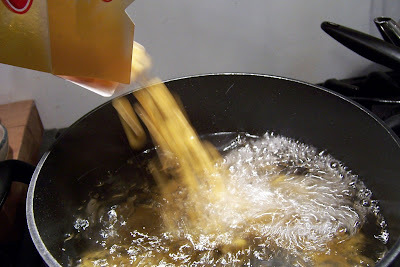 Bring one gallon of salted water to a boil in a six quart (or larger) pot. Add your pasta, and cook as directed on the box. 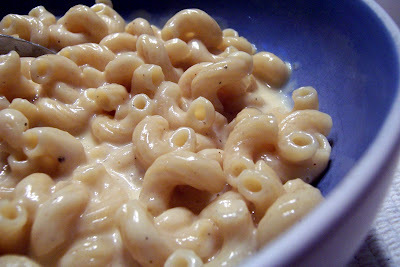 Try not to over cook the pasta, as it'll pull some moisture from the cheese sauce. Also, don't pre-cook your pasta. You'll need the heat from the freshly drained pasta to help build the sauce. 2. 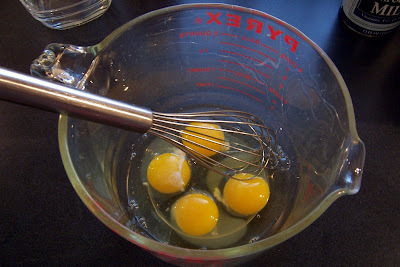 While the pasta is cooking, crack your eggs into a medium mixing bowl and beat well with a whisk. 3. 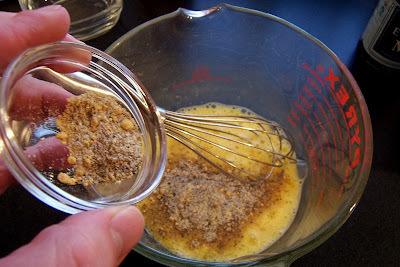 Combine the salt, pepper and dry mustard in a small dish, and slowly sprinkle it in as you beat the egg. Add the hot sauce and beat just a little while longer. 4. 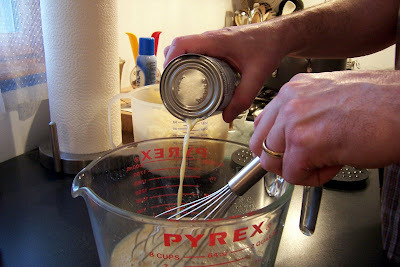 While still beating the egg, SLOWLY drizzle in the evaporated milk. Have you checked your pasta recently? Good. 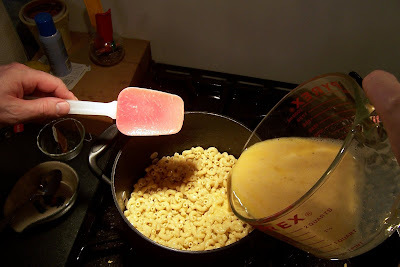 Set the egg/milk mixture aside until the pasta is done. 5. When the pasta is done, cut the heat, drain the pasta, and return it back to the pot. 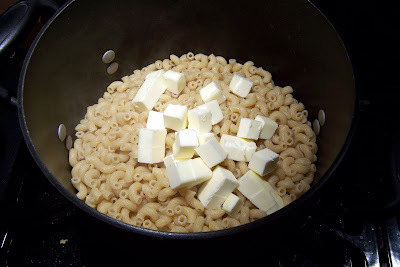 Add the butter and stir it into the warm pasta to melt. 6. 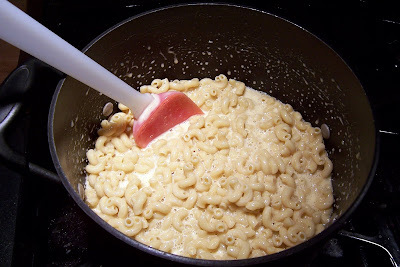 While no one is looking, scoop up a spoonful of buttered pasta, sprinkle on a bit of kosher salt, and pop it in your mouth. Mmmm.... it's good to be the cook. 7. 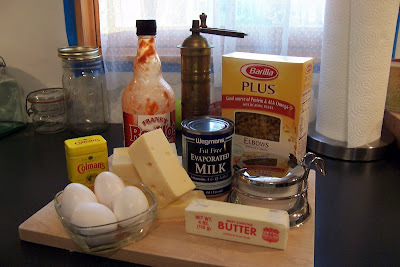 When the butter is melted, pour in the egg/milk mixture and turn the heat to medium. Stir the mixture to heat through. 8. 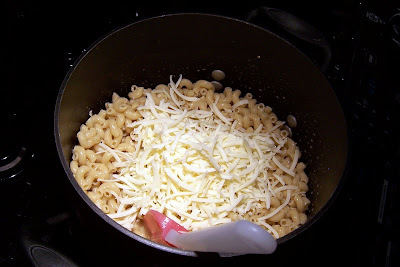 Slowly start adding the shredded cheese by the handful, and mix in to melt. 9. When all the cheese is in the pot, and melted, continue to cook for three minutes, stirring constantly. Serve hot. This recipe can easily be halved. Just use a small can of evaporated milk. We make it full-sized, and fridge or freeze the leftovers.